A Google patent application explores how Google may answer factual questions from unstructured Web pages and results rather than from more structured sources such as Freebase or Wikipedia. 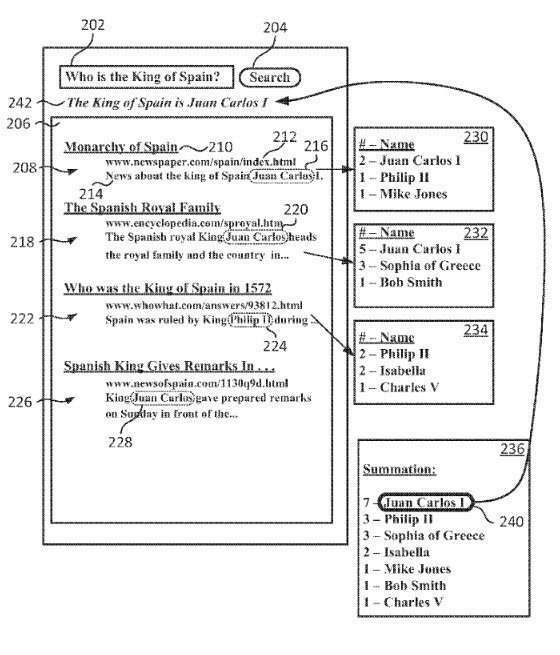 The processes described in the patent are pretty interesting, and they might be more familiar to an SEO trained audience than a Semantic Web one, like a result that ranks well because of a “query deserves freshness” approach. They also avoid a problem for the search engines that I’ve been thinking about for weeks. “What happens when the world changes in some dramatic fashion, such as a country ceasing to exist, or a well known figure passing away”? Nicolas Torzec answered the question, telling us that editors would be alerted to the change so that they could edit the knowledge base by hand. While it was good to hear that there was some process in place, it would have been even better to hear of a more automated response that could update such information quickly with less possibility of human error in the updates. Sometimes a lot of things change in the world quickly, all at the same time. If knowledge graph updates are needed to answer some fact-based questions, there’s the potential for those answers to be incorrect until an editor makes an update, when a change takes place. I’m sure Yahoo knowledge base editors probably make such updates quickly, and it left me wondering how both Google and Bing respond to such changes. 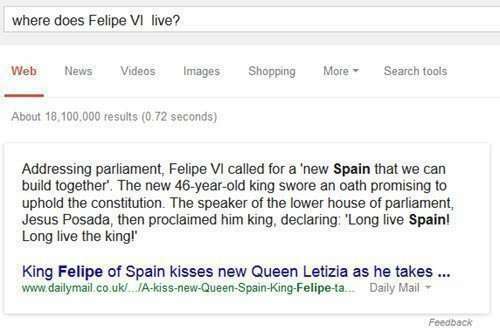 How does Google’s Knowledge Graph get updated, or does it wait until Freebase and other sources are edited to reflect such changes? And what of Bing’s Satori? I’m not sure of either, and I don’t know if investigating will reveal much. 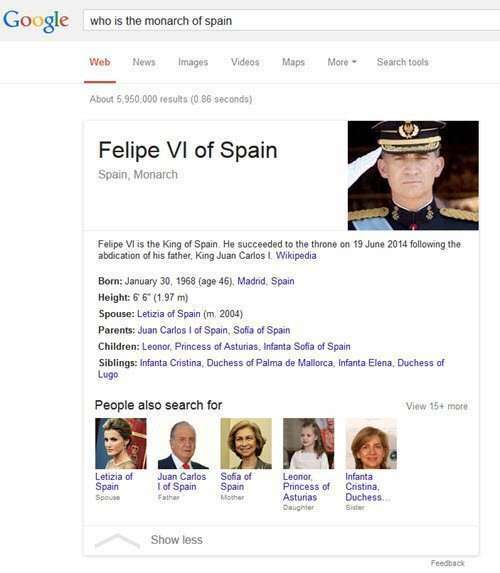 Regardless of Google’s lack of information about this recently (July) crowned King of Spain, it did know who he was, and it’s possible that not much has been written about him on the web. Answers may be provided for queries in an automated and continuously updated fashion, rather than relying upon a knowledge graph being updated. Question answering may take advantage of search result ranking techniques like rankings for freshness or topicality. Question answers may be identified automatically based on unstructured content of a network such as the Web. Yahoo doesn’t seem to have updated information about the new king, or at least it doesn’t return him as an answer at all. Then again, while Google has more timely news, they still seem to have some issues. It’s exciting watching things like these evolve. So let’s look at this new Google patent application, and see how these “advantages” might play a roll in what we see. Methods, systems, and computer-readable media are provided for collective reconciliation. In some implementations, a query is received, wherein the query is associated at least in part with a type of entity. One or more search results are generated based at least in part on the query. Previously generated data is retrieved associated with at least one search result of the one or more of search results, the data comprising one or more entity references in the at least one search result corresponding to the type of entity. The one or more entity references are ranked, and an entity result is selected from the one or more entity references based at least in part on the ranking. An answer to the query is provided based at least in part on the entity result. 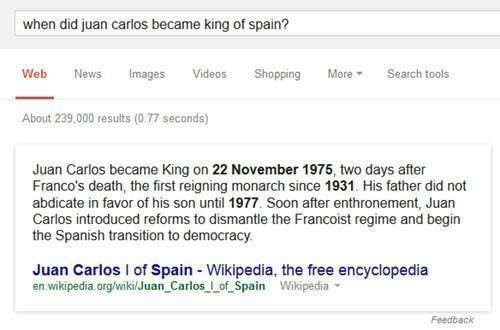 It looks like the patent missed the latest regime change in Spain, still listing Juan Carlos. This is one of the problems that the patent is aimed at solving. As used herein, an entity is a thing or concept that is singular, unique, well-defined and distinguishable. 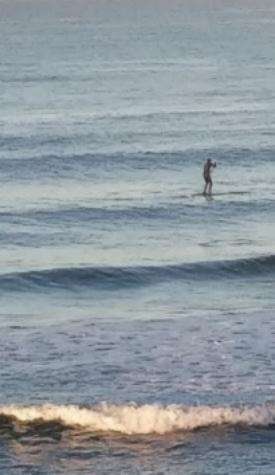 For example, an entity may be a person, place, item, idea, abstract concept, concrete element, other suitable thing, or any combination thereof. Generally, entities include things or concepts represented linguistically by nouns. For example, the color “Blue,” the city “San Francisco,” and the imaginary animal “Unicorn” may each be entities. An entity generally refers to the concept of the entity. In some implementations, an entity reference is a reference, for example a text string, which refers to the entity. For example, the entity reference “New York City” is a reference to the physical city. In some implementations, an entity is associated with a type of entity. As used herein, a type is a categorization or defining characteristic associated with one or more entities. For example, types may include persons, locations, movies, musicians, animals, and so on. For example, “who” questions may have answers of the person type. It will be understood that while the system described below is generally shown in reference to natural language “who” questions, Any suitable type of question may be answered. A query may be a natural language search query (written or spoken), or received from user input, from another application, or generated by the search system based on previously received input or data. As part of the process, search results may be returned based on the query that may come from an index of webpages and other content, on the web. This system next looks for from entity references such as references from the top ten search results. Those retrieved entity references may be ranked, an entity result may be selected based on the ranking, and an answer may be provided, based on the entity result to answer the question. Sometimes information retrieved from entity references associated with a particular webpage may be in a list of persons appearing in that webpage. That list by itself might be a good answer if the question appears to be asking for a list, but it’s possible that the top listed result may be chosen as an answer like in the pictured example above. Sometimes the top ten or top 20 results might be looked at, and an entity chosen from those. The chosen answer would have to fit the question type correctly, such as being a correct type of entity to fit a “who” query. If multiple entities turn up as candidate answers, they might be put into a list, and ranking signals associated with them might be used to choose what may be the best answer. The highest ranked entity could be chosen as the answer. Frequency of occurrence relates to the number of times an entity reference occurs within a particular document, collection of documents, or other content. Topicality scores include a relationship between the entity reference and the content in which it appears. It’s probably worth testing and re-testing this from time to time to see if it appears that Google is using this approach, and looking at the search results that might appear in response to a question answering query, to see if it looks like Google has used search results to try to answer a question. The patent tells us that one quality score that could be used might be the number of links pointed to a page about a certain entity. While that is fairly simple, it’s a little different than the amount of times a “fact” object appears in a data “object” such as a knowledge base that might act as an answer to a query. It’s as if Google is using the entire web as a data object where it can find answers to questions. The patent provides an additional number of details, and I didn’t provide all of them here, though I’m going to include some others right now. How those all might fit is isn’t necessarily made clear in the patent, but what is clear from it is that sometimes answers aren’t readily available from a source such as Freebase, and when those times come about, sometimes Google may use the Web as a knowledge base, and look for entities in search results to find those answers.